Roberts managed to take an early lead to start the first, landing left hands early and often against the perennial contender. Roberts mixed in kicks, then clipped and stunned Okami with a crushing left hook. Okami closed and went to the clinch, trying to wrangle Roberts to the mat. He finally succeeded at dragging Roberts to the mat and then went to work trying to pass the guard of his opponent. Okami finally made his way to the back of Roberts before pouring on an onslaught of alternating strikes from the top. Referee Herb Dean took a close look but Roberts survived to see the second round. Roberts came out strong in the second, landing some big left hands that again stopped Okami in his tracks. 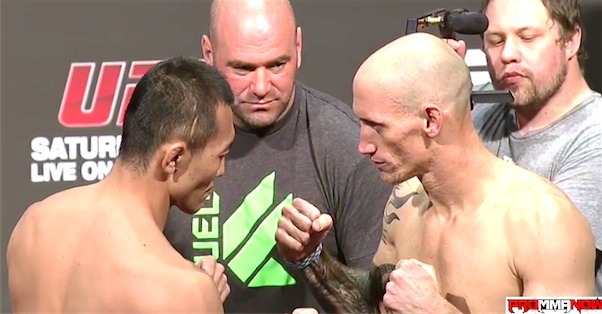 Okami immediately used a laser-straight left hand to close the distance and clinch with Roberts on the cage. Just like in the first, Okami managed to drag Roberts to the mat and again dominate positioning on the canvas. Okami moved to full mount, then took the back as Roberts tried desperately to roll out of trouble. From there Okami poured on the right hands, forcing Roberts to cover up. Referee Herb Dean urged him to fight back and when that didn’t happen, he stepped in to stop the fight at 3:05 of the second round. With the win Okami moves to 27-7 overall, moving to 11-4 in the UFC. Roberts falls to 12-3 (1-1 UFC).